Making the bread coating stick to baked chicken is not as difficult as you may think. 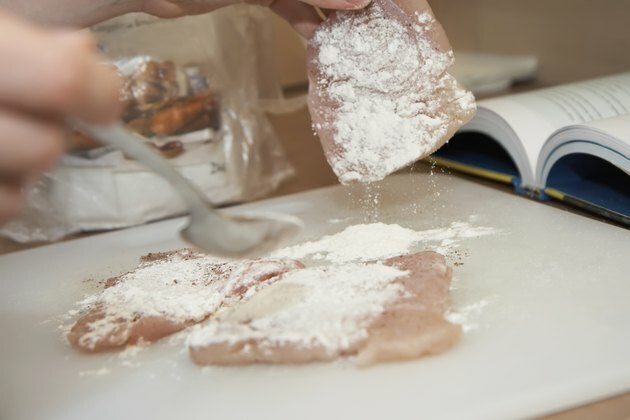 The trick to making the breading stick is to dry the surface of the chicken, and then create a glue-like surface with a flour and egg blend. As a result, breadcrumbs adhere to the surface, creating a crispy outside that helps keep the meat moist. Breading that sticks to the chicken has a similar texture to the fried alternative, but is lower in fat and calories. Measure the flour and pour it into one of the shallow bowls. Crack two eggs into a second shallow bowl and beat it with a fork to combine the white and yolk. Pour the breadcrumbs into a third shallow bowl and mix in salt, pepper and other seasonings, if desired. You can use preseasoned breadcrumbs and skip adding your own. Line up the bowls in the order of flour, eggs and breadcrumbs, to make it easy to coat the chicken. Pat the chicken with a paper towel to dry the surface before adding the breading. Roll the chicken into the flour to coat evenly. Tap the chicken to remove excess flour. Dip the coated chicken in egg, and then roll it in the breadcrumbs to coat it evenly. Place the chicken on a greased baking pan immediately after coating it with breadcrumbs. Seasonings and herbs that complement chicken include sage, thyme and marjoram. Finely ground breadcrumbs stick to chicken better than course ground breadcrumbs. Grind the breadcrumbs in a food processor to get them to a fine consistency. Bake breaded chicken at 375 degrees F for about 60 minutes, or until the juices are clear and the internal temperature is 165 degrees F. Check the internal temperature at the thickest point on the piece of chicken, using a meat thermometer.